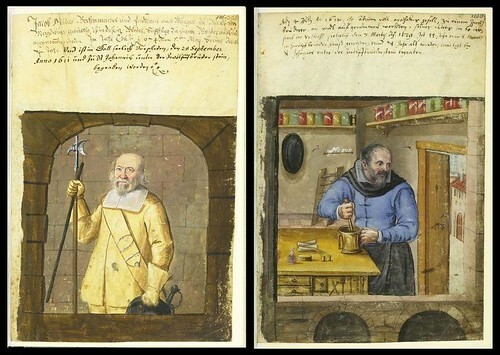 In 14th century Germany, a wealthy trader by the name of Mendel established a charitable endowment in the city of Nuremberg, known as the Twelve Brothers House Foundation (Zwölfbrüderhausstiftungen). A dozen elderly and unwell (but capable) citizens were (I assume) given a place to live in exchange for their performing work duties. Although the house life and routine was said to have been inspired by the example of the apostles, there was a fairly anti-clerical or anti-religious tone to the rules and priests were formally excluded from being taken in as one of the 'brothers'. The house served as a model for the commencement of similar charity foundations in other German cities. 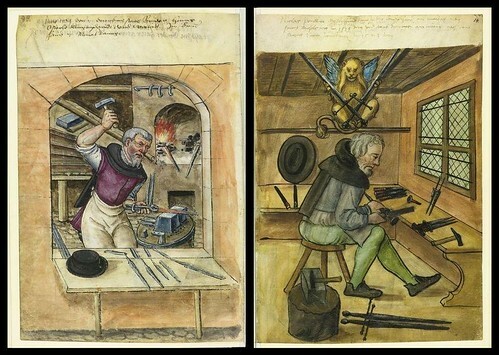 Mendel's grandson began the practice in the 15th century of having sketches made of each of the brothers engaged in their chosen employment together with detailed notes about the tools and practices relating to their work. 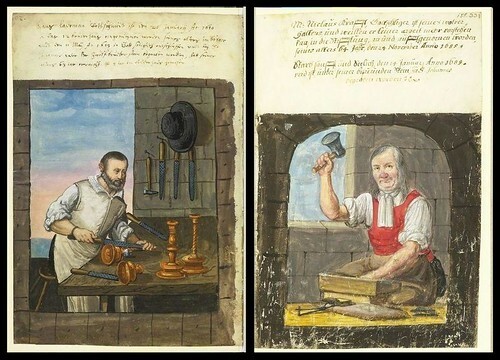 The manuscripts were updated until (I think) the beginning of the 19th century, although portraits of craftsmen engaged in their work were only produced in the 15th and 16th centuries. 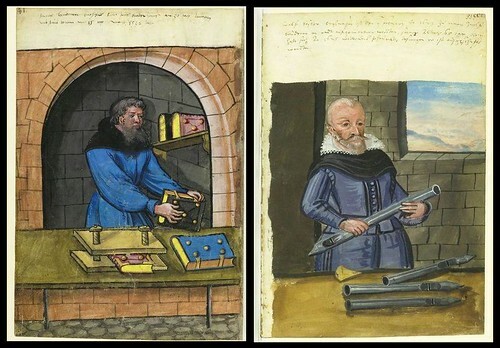 The images depicted above come from the Landauer Twelve Brother's House manuscript - essentially a similar foundation copied from Mendel's original idea. 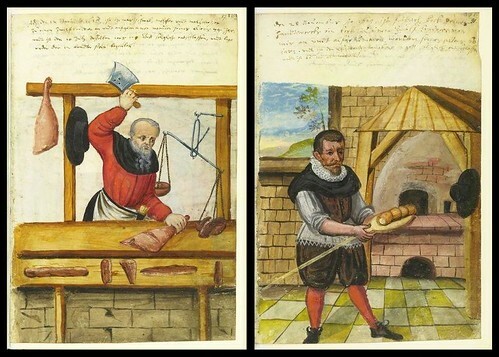 The Mendel and Landauer manuscripts are said to be among the most important primary sources in relation to the crafts and guilds of the middle ages in Germany. 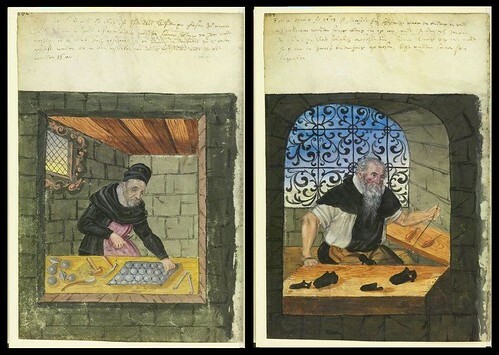 A website has been established and both sets of manuscripts are to be uploaded. 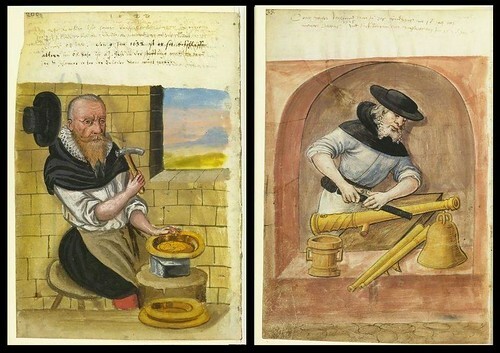 At present, two volumes of the Landauer books can be viewed, although the suggestion on the site that high resolution scans have been made is not reflected in the files available to the public. I have taken the liberty of removing all the watermarks from the above images - as though ~450px wide illustrations need protecting (!) - and clicking on any image will take you through to a full sized version. The occupations in the captions above are a 'best guess' at times. 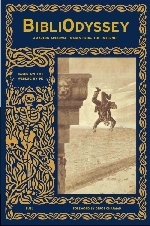 If you read German, you will find a wealth of information, which is why I've included the direct links to each image above. For the rest of us, translations are at best sketchy and I found them more often than not confusing and fairly useless. But the site is being supported by some useful metadata that allows searching by tool, occupation, disease (the manuscripts are, I suspect, fairly detailed in their reports about individual members) and the like. This site provides the best background in (semi-fractured) English. UPDATE: See Jeff Peachey's post from 2009 which has some more information. Happiness. 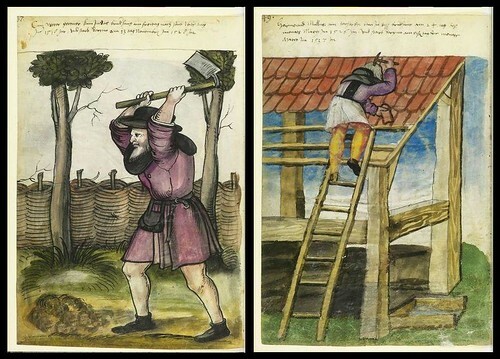 Like always a very good comment about some illustrations of the Middle Ages. To offer thank you those who do not speak English also a translator that facilitates us the life. 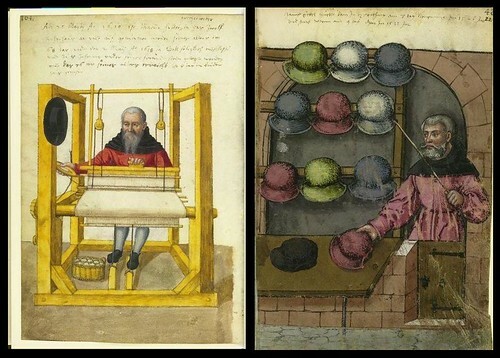 Those are great, but I was rather incredulous at the baker's Elizabethan ruff (less so the metalworker's as it was smaller and more obscured). 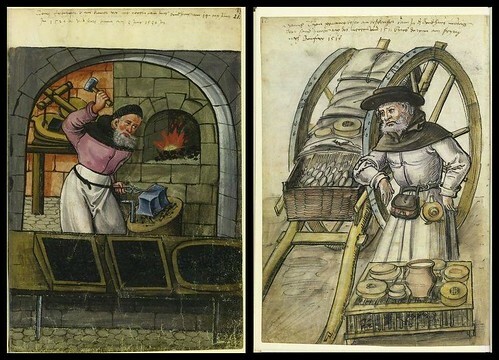 Very impractical gear for baking, and pretty much everyone else seemed dressed to work. As for the lack of interest in taking in priests, I imagine that Mendel was Jewish. Whether the brothers were also Jewish is an interesting question. Perhaps I should test out my bad German and see if this is specified. Rummaging around in the links was inconclusive. 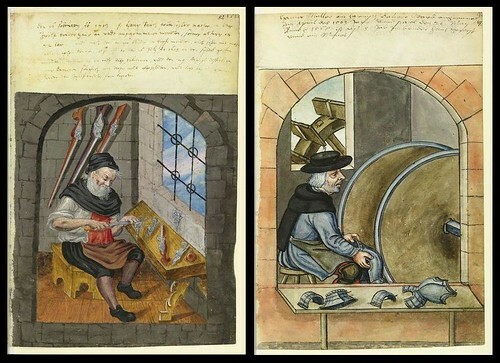 The site in the non-native English showed brewers from the Mendel manuscript, many of which show a six-pointed star. My immediate thought was that this must mean the brewers in question were Jewish, so I looked at the linked PDF on "hexagrams," which covered about every sort of hexagram in history, including the Star of David. The PDF states that the hexagram was a brewers' sign, but it uses the Mendel manuscript as evidence of that. I was going to say I've never heard of anyone named Mendel who wasn't Jewish, but then Gregor Mendel popped into my head and he was Catholic (an abbot at the time of his death! ), so who knows. Mark, the translation actually said "organ maker" and I couldn't quite reconcile that with what I was seeing. So I have maligned the translation bot unnecessarily. I'll change it. Just found your blog and I am positively giddy. (in a good way...not in a crazy blogger stalker way). 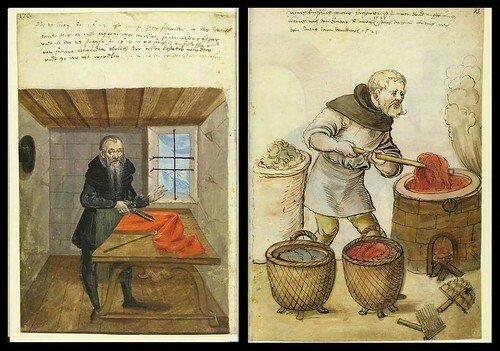 I am always looking for clothing references for 14th century laborers. The court messenger looks the most disgruntled out of the lot. oh wait...I take that back. The glazer looks like the fumes might be getting him down. Anyway, thanks for finding these. 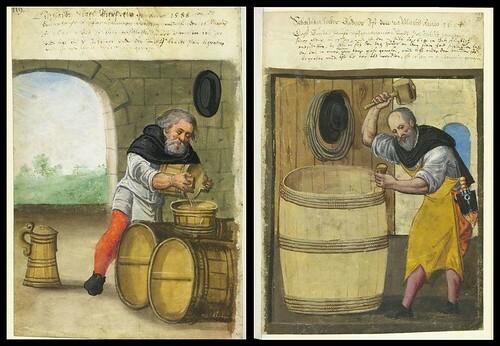 Images of daily life, like pictures. 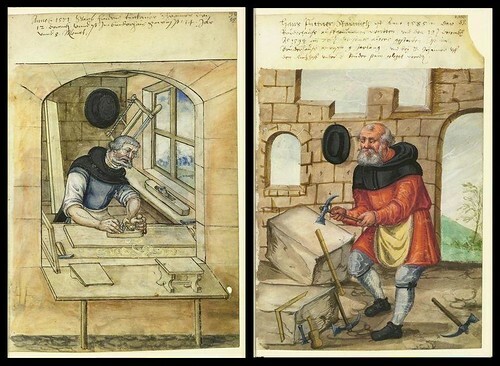 http://upload.wikimedia.org/wikipedia/commons/9/9d/Landauer_I_011_v.jpg Is this from the same series? Looks like it, doesn't it.